That installer is a HUNK. Wonder if he was an actor. I saw a few cute ones in my 30 years, but, not quite that good. 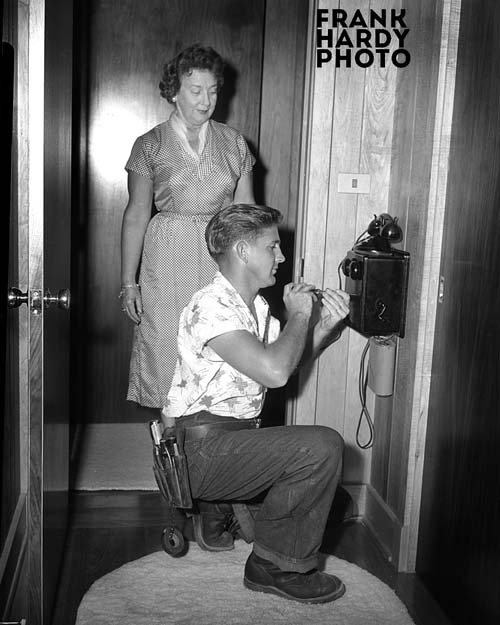 This young man installing this telephone is Chester/Chet Sanders , sadly now deceased but quite the character in & out of the telephone business. After retiring from Southern Bell he went into the restaurant business selling mullet fillets to people who would never eat those ‘trash fish’………his two restaurants are still doing well on Navy Blvd & in Pace ….he would be justifiably proud of his accomplishments. 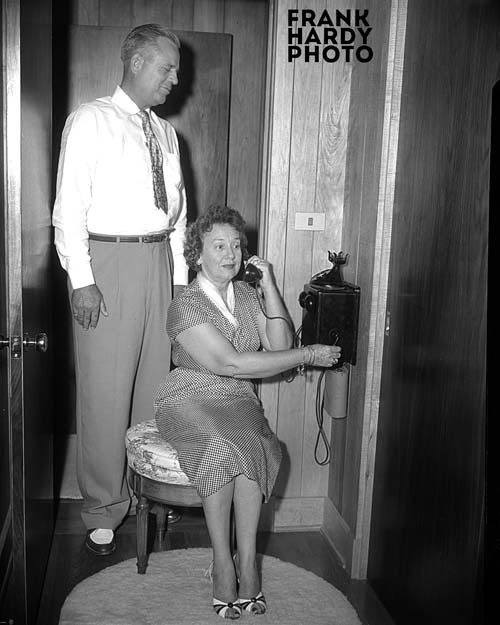 Our first telephone was installed in 1953. It was a regular handset with a dial … not attached to the wall with a crank. Of course, our telephone number was just 4 numbers … which was 3334. In later years, Southern Bell added the HEmlock and then went straight to the numbers 433-3334. My parents still had the same number when they passed away in the late 1990’s. On N st. 1943-49, our number was 84724. I learned it early and never have forgotten it. alas, hard to remember what happened 10 min. ago now. I believe this is a picture of Chester Sanders installing the first telephone in Navarre about 1955 or 1956. This photo was made to promote the Navarre exchange because until this time there were no telephones in this area. The only way a call could be made the customer had to call the operator to be connected with whoever they were calling the operator would get a signal and say “number please”. I began working at Southern Bell in late 1955 and worked for 32 years until retirement. I believe this photo was published in the Pensacola News Journal. Until the 1970’s, you could not own a telephone. I recall that it was illegal to hook up your own phone to the Southern Bell network. All phones were owned by Southern Bell, and you rented them from the phone company. The upside to renting the phone was that repairs to the phone or the phone wiring in your house were free. The early phones I remember from the 60’s were rotary dial phones. My parents had two desk models, while my grandmother had one that hung on the wall in her hallway. I started work for Southern Bell in 1971, by the time I retired 30 yrs later it had changed to Bellsouth and at the end AT&T. I, too, had the rented phones, one that I paid pretty hefty fee for, it looked like an old French phone, off white and gold. When the Co. stopped renting the phones, they sent employees the “deeds” to our phones. Not sure they still work, but the pretty one is in a guest room just for show. Others in attic.